CAN'T BREATHE... no end to overwhelming emotions - needing support to stop the "merry-go-round" cycle. Feeling like the other parent has given up on our child. Doing everything but accomplishing nothing - the reoccurring pattern. Something needs to change, but I don't feel heard, can't find my voice and pull out of it. Now what - how do I take care of myself. How do I move on. How do I live the life I imagined. Nothing seems to be the right answer. Don't know where to begin. Looking for encouragement and a ray of hope. Who am I now that everything has been taken away? The children of straight parents are protected across The United States of America by the Uniform Parentage Act. 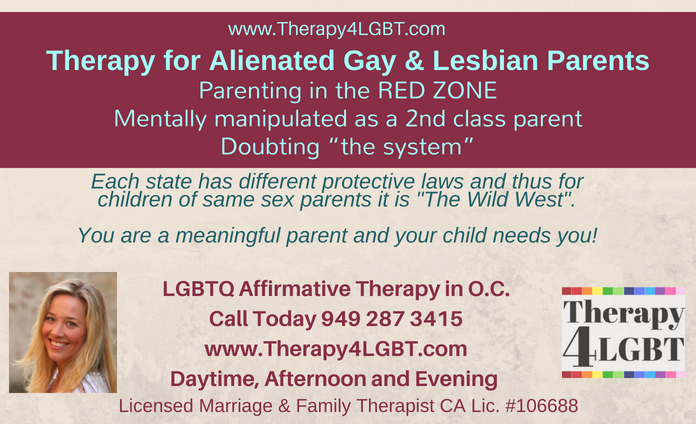 However, for children of LGBT parents it is "The Wild West" as each state has different laws. No matter what family is going through parental alienation, it is ultimately the child who has to endure the chaos and remains the victim. Talking to an ex, alienation though divorce and co-parenting might get you in the red zone. Maybe some regrets are part of you feeling that the transition is difficult? "One day I went to pick up my child at pre-school, but she had been picked up by my ex and went to another country..."
"A parent's love cannot be taken away although my ex changed my child's legal name..."
"It was horrible. I felt my country undermined my standing as a parent..."
"It has been a long journey navigating the reunification process"
"My partner fled with my child to 3 different states..."
"My ex is lying left, right and center...."
"I have not seen my child for 2 years..."
Do you feel that you are a "visitor" in your child's life? OVERWHELMED... Being a father, mother, daddy or mommy can seem like a whirlwind of challenges when you can't find your voice or assert yourself. Navigating being separated and a second class parent after a devastating divorce may affect your relationship with your ex, children and family. Although you took upon you the obligation, responsibility and was liable for your child, you are now seeing your child being discriminated against due to their parents' relationship status. Having tried talking to friends, coworkers or family, not finding someone to help navigate through the minefield of emotions- talking to a third party might be an option. Don't wait one more day. I would be honored to help you! The hardest part is calling me.